MPW-0102 - Weighing in at 1 lb. 1 oz. 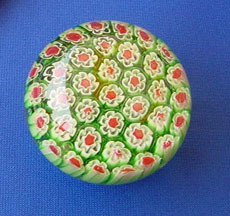 this wonderful paperweight is green with pinkish hues. You almost feel a sense of serenity sneaking in. 2-1/2 inches around and its all paperweight in a small space. $50.00 is the asking price for this Millefiori paperweight.